How will you make a difference in the world? 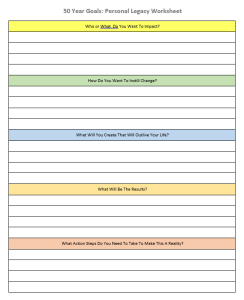 To help you think that far out and plan different outcomes, I created a simple Personal Legacy Worksheet. 1. Who or What Do You Want To Impact? This basically describes your tribe or sphere of influence. People or items that fit into your niche. This may be children, family, customers, contacts, users, followers, readers, viewers or other people that are impacted by you. In the worksheet, it’s helpful to be specific about people that you can truly help. Your goal may include animals or pets or possibly environmental items such as trees or plants. Be as specific as possible. 2. How Do You Want To Instill Change? What will you do to instill changes and make a difference? For example, you may want to impact your children, by sending them to college. You may want to start a business, church or organization that will affect hundreds or thousands of people. You may want to plant trees, save pets, or clean up the environment. List the change you want to see. 3. What Will You Do/Create That Will Outlive Your Life? Maybe you want to start a long term savings plan for your children’s college fund. You might want to write a book, start a business, create an outreach. What you put here should continue on, even if you pass on. Financially you might include items like life insurance or annuities. For information items, you might include writing a book, creating a video, or outlining a song. Physical items may include things like building a house or school, planting trees or plants, or creating a new product, such as a computer or music player. 4. What Will Be The Results? This is where you get to extrapolate the results of your plans and actions. 50 Years is a long time, and the multiplier effect of networking, leadership, and compound interest can lead to some spectacular results. This is where you get to dream a little. For inspiration, take a look at my previous post, that includes three examples of people who are truly making a difference. 5. What Action Steps Are Necessary To Make This A Reality? This is where the rubber meets the road. Write down some milestones here. Just outline the main steps. You don’t need to get too specific, you’ll do that as you plan out your shorter term items. Write them down by decade or by specific event. Fill out the sheets starting from the top and working your way to the bottom. Try to pick specific areas of interest if you can, and realize that technology and the world will certainly change over the years. Picking evergreen, people based goals will help. Take a step back and visualize what you wrote down. This particular goal sheet will change over time, as your life evolves. I like to review this sheet at least once a year or at major milestones along the way. You can three hole punch this and keep it in your goal setting notebook. I love starting with this 50 year sheet, as it really helps you see what is important in the world and how you can make a difference. It moves a lot of the personal goals down a notch, to the five or ten year levels. 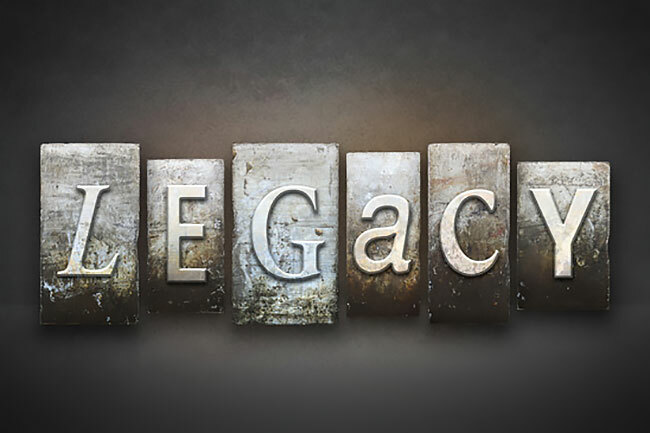 In my life I’ve been involved with a few legacy projects. When my dad died, his estate left some funds for a couple of projects. One was to plant 5,000 trees in Africa, where deforestation had ruined the land. My dad was always planting trees when he was alive, with over 30 in his backyard. Trees are a wonderful example of a legacy goal. In my dad’s project, the trees are now nine years old, and have completely changed the landscape and brought life back to a struggling community in Kenya. My dad also had a love for kids, so some funds were set aside to build a small playground for children in Murrieta. Every time I drive past it, I can see my dad smiling, just like the kids who are using it. Both of these continue on my dad’s memory as a kind and caring person. I have some friends at my old church that have built homes and a school for the needy in Mexico. They create them in the Church parking lot and take them by trailer to a remote farming community, inland of Ensenada in Baja California. These home will last for decades and provide housing and shelter to people who were literally living in cardboard boxes. Certainly changing the legacy of almost everyone involved. Writing your ideas and dreams down is the first step to accomplishing them. What amazing goal will you put on your personal legacy worksheet? We will continue this series as we look at setting 5 and 10 year goals in our next post.